The Internet of Things (IoT) and 5G are proving to be major evolutionary impulses in the telecommunications industry. Both demand a high degree of network complexity, innovation and flexibility, together with faster networks than ever before and even completely new business models and ways of thinking about services and how they are delivered. In this era of reinventing telecoms, CSPs who take all this on board will come out on top of the game – but in order to do so they must find ways to raise levels of automation. In fact, automation in telecommunications is already fairly mature. Software-defined networking (SDN) and network function virtualization (NFV) have allowed operators to separate physical network functions and software resources to create an ecosystem ripe for swift innovation and higher revenues. SDN is common now in data centers for service automation. In order to truly evolve in this sphere, CSPs need to take the next step – deploying SDN to automate operations too. To make this possible, they need to harness the power of artificial intelligence (AI) and machine learning (ML). The challenge lies in the smart application of intelligent algorithms for OSS. Such algorithms should be capable or taking a holistic view of the network, understanding prevailing and historic status, assessing available resources and service demand, and ultimately recommending action based on these factors. This isn’t 100 per cent automation – intelligent algorithms still need to be activated – but once deployed such a solution will be capable of learning from network and service events. Traditional AI and ML solutions learn on the basis of static models that rely on supervision and offline data training. Artificial intelligence for future operations takes a different approach, with reinforced learning allowing the OSS to operate in real-time environments, collect, assess and react to data, run continuous simulations of potential scenarios, and take or recommend action to influence service provisioning. Thus, a closed loop of automation is created, in which – due to the simulation aspect – the network needs to be able to calculate several steps ahead of real time. In this model, static and dynamic data supply real-time information to the AI and ML engine, which scrutinizes changes in the network via a reinforcement agent. This reinforcement agent interacts with the simulated environment in discrete time steps, each time choosing one of several available actions which can be sent to the simulated environment. 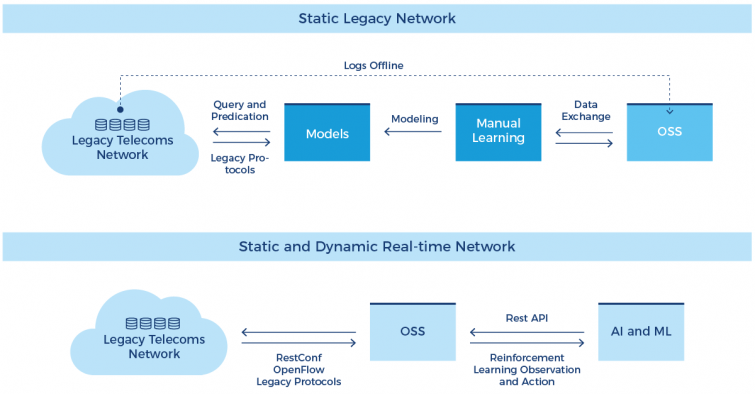 Based on a rapidly expanding library of observations and simulated actions, the OSS can update automatically to respond to the most recent real-time changes in the network. The time, effort and costs involved in switching to OSS automation based on this model may seem overwhelming to an executive preparing a business case for transformation. Yet operators will see clear benefits. Decision-making will speed up exponentially, allowing operators to become proactive instead of reactive, and to eliminate many network issues automatically – before they become a potentially costly problem for customers. In addition, professionals in an operators’ IT department will spend far less time on troubleshooting and repetitive tasks and focus on strategic initiatives that can help the organization take full advantage of the opportunities offered by 5G and IoT technologies. Azam is a telecommunications engineer with 10 years of practical experience in researching and introducing innovative technologies. Having gained his masters degree in engineering, he worked extensively with Vodafone UK and 5Gic on SDN/NFV and 5G, and as a fellow member of the Institution of Engineering and Technology he now focuses on future OSS, AI, machine learning and techno-economic analysis.